The original sanctuary was completed in 1917. Even more amazing is that it was built by one man, Felix Rebom, a Spaniard, and his assistant. Their only tools were a hatchet, a trowel, a plumb line and a T-square. The church is patterned after an old city mission church in Mexico. Eleven years later, in 1928, a 400-year-old, hand carved, solid walnut door was located in a monastery in the Pyrenees mountains and purchased for the entrance to the sanctuary. The sanctuary is made of limestone rock, which was donated by Mr. Fin L. Pierce for the building of the church. 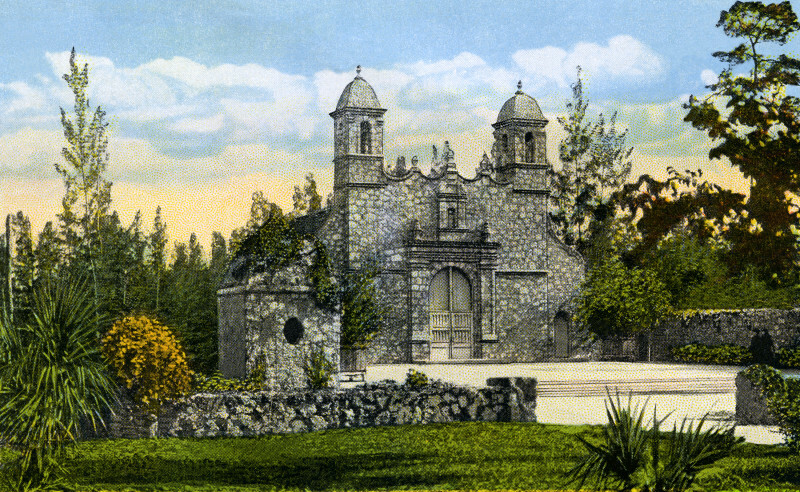 The limetsone was surface rock taken from Mr. Fin's property in the area of Coral Gables we now call Cartagena Plaza, also known as Coco Plum Circle.The sanctuary was enlarged in the early 1950s with the addition of the transepts and chancel. This addition transformed the sanctuary into a cruciform (cross-shaped) style, reminisent of Romanesque and Gothic Christian church architecture. The bells in the church’s two towers were designed for Plymouth by Van Bergen Bell Foundries of the Netherlands and given to the church by Mr. Fin L. Pierce's daughter. The bells were installed in time for Easter Sunday 1957. Renovation of Plymouth’s pipe organ, the largest in the City of Miami and the third largest in Miami-Dade County, was completed in 2009. The original magnets (which open and close the pipes) were replaced – all 2,560 of them! To enhance the sound in the sanctuary, 61 new façade pipes were installed at the back of the chancel. 2017 marked the 100th anniversary of the very first Sunday service in Plymouth's sanctuary and celebrations took place to honor this centennial year. Just in time for Valentine's Day, Plymouth hosted a Wedding Sunday as part of the celebrations of the 100 year - old sanctuary. Couples married at the Coconut Grove landmark church returned for the Wedding Sunday service on February 12. Couples married at Plymouth were an important part of our service, which was followed by a reception, complete with wedding cake, in the Cloister Garden. Plymouth Church opened its doors at 3400 Devon Road after moving from its original location on McFarlane Road, where it was founded in 1897 as Union Congregational Church. 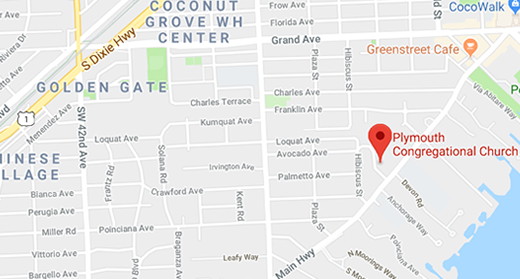 Plymouth's history is indeed intertwined with Miami's history and especially the history of early Coconut Grove. Its former pastors include Solomon Merrick, father of George Merrick, founder of the City of Coral Gales. The younger Merrick served as chair of Plymouth's Board of Trustees and was instrumental in purchasing the land the sanctuary now sits on. The Plymouth campus is home to the first schoolhouse of Coconut Grove, also listed on the National Register of Hisotric Places and includes the former homes of two U.S. Navel admirals.